Options For Beginners is the first step in achieving overwhelming success in the world's most misunderstood markets. You have probably heard of and likely have invested in mutual funds or the stocks. But there is a more consistent and predictable way to build your money. 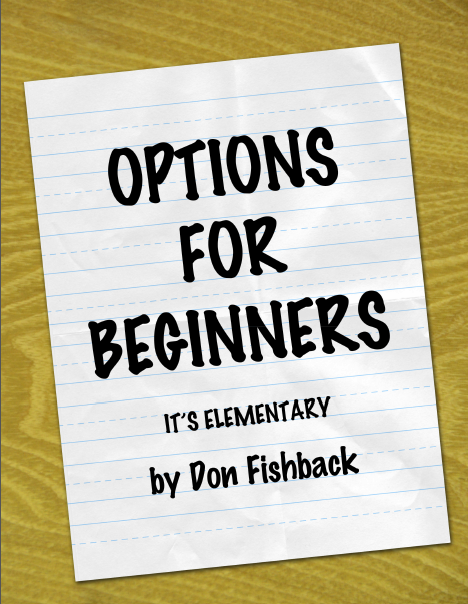 Options For Beginners shows you how to trade options - but not the way most people do it. When done right, you can profit consistently 85% to 90% of the time. Options For Beginners takes you step-by-step through all the basics of options trading before divulging a basic strategy that puts the odds of winning in your favor each and every time you place a trade! YOU DO NOT NEED TO BE AN EXPERT! In fact, to make sure this book delivered on its promise, we had a group of 7th graders proof read the book before it was published to make sure they understood how options work. If a 7th grader can use the book to gain this knowledge, so can you! EXTRA FREE BONUS: You will also receive the bonus report, How To Win 80% of Your Trades or Better For Over 60 Years and Counting, In this eye-opening report, Don Fishback shows you a simple technique that generates consistent winners by changing the rules of investing. This Special Bonus is included in the book. "You can profit...and help to find a cure for heart disease. "Now, I'm about to share with you something near and dear to me. I don't make one red cent selling this book. Every penny of profit will be donated to the American Heart Association. You see, my Dad was a true inspiration to me until his fatal heart attack. I've also lost an Uncle and both my Grandfathers to heart disease. Every dollar I make from this book is donated to the American Heart Association in my Dad's name. And I'm hoping that you'll follow my lead and donate a portion of your profits to the American Heart Association, or your own favorite charity." The American Heart Association, as a health organization, is not in the business of providing investment advice. While the AHA does welcome the contributions made to it by Don Fishback, the AHA is not in a position to, and therefore, the AHA naturally cannot endorse the book itself. Note: So that you have instant access to the information in the book, and to boost the contributions to the AHA to the highest level, Options For Beginners is provided electronically in an ebook! The ebook is in a PDF format. We'll send you the link to download the ebook via email. When you receive your receipt, just click the Download link.